Our American Girl Book Club bedazzled sunglasses, hula-ed hoops and made sand art when they traveled back to the 1950s and met Maryellen. Our next meeting is 4 p.m. on Dec. 5 in the children’s section of our Main Branch on Mentor Avenue. The girls will be meeting Julie. 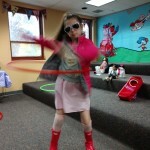 Learning out to hula hoop with our American Girls. 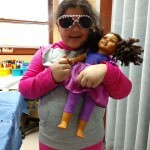 Makayla models her newly bedazzled sunglasses. 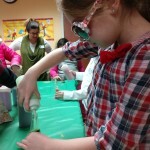 Evie makes sand art during our American Girl Book Club.